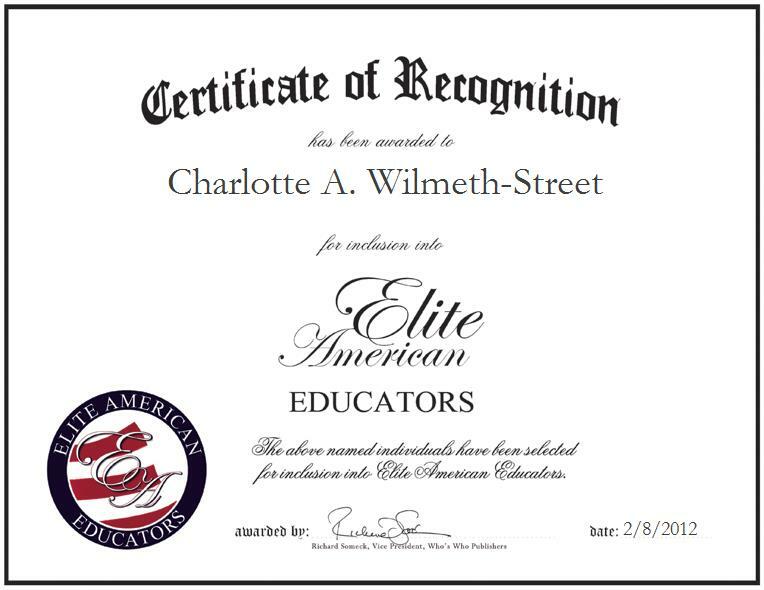 Charlotte A. Wilmeth-Street is the English Language Department Head for the Academy for Academic Excellence at the Lewis Center for Educational Research in Apple Valley, California. With a sophisticated background in 12th grade English literature, Ms. Wilmeth-Street lends her expertise to the organization that has been called “one of the most interesting, unique and unusual schools in the nation.” Influenced by a college professor to pursue a career path that would allow her to enlighten and edify others, Ms. Wilmeth-Street took the advice of her former teacher nearly 20 years ago, and she has since been able to give students the tools they need to advance as future leaders. She pinpoints the highlight of her career as her being hired to work at one of the only two lab schools in the country. Ms. Wilmeth-Street is committed to supporting initiatives that help people in a number of ways; she champions such worthy causes as the American Cancer Society’s Relay for Life and Habitat for Humanity International, and she thoroughly enjoys teaching.